Symbolic of the concerns rising in the United States over the NSA and flying surveillance cameras (or drones), artist Adam Harvey has created Stealth Wear: clothing that claims to conceal the wearer from drones, almost like a real life Invisibility Cloak. Stealth Wear claims it can do this by utilizing a flexible, metallized fabric that uses fibers to reflect a human’s body heat and conceal his thermal signature. The metal in the fabric blocks the photos from being taken, as well. Although the garments were originally created more as artistic pieces meant to create conversation over security and privacy in the public sphere, they are also being produced and sold to private individuals. There are three styles of the anti-drone Stealth Wear currently being produced: a hoodie (which actually only reaches the midriff), a scarf (meant to be a hijab), and a burqa. 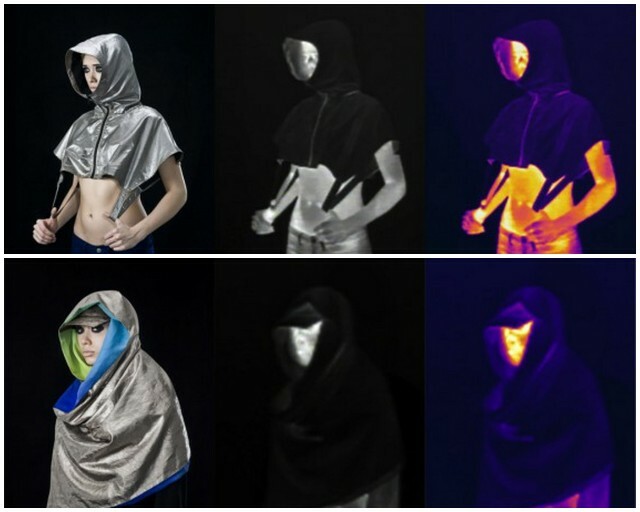 However, the price points and styles of the pieces raise important considerations for this type of wearable technology—the hoodie is $350, the scarf is $450, and the burqa is $2,500. At this cost, only the wealthy will be the ones able to buy this technology—are their lives worth more? These garments will be sold in a pop up museum shop like those mentioned in Fashion: A Very Short Introduction, and this type of shop suits this project perfectly due to its attention-grabbing nature and conversation-setting agenda. The artist also said that he chose to design his Stealth Wear as a hijab and burqa because they act as a metaphor—just as the garments are seen by traditional wearers as “separation between man and God,” he designed the anti-drone versions to “provide separation between ‘man and drone.’” This cultural appropriation seems to make light of a garment significant to Islam, which reveals s a lot about Westerners designing for international audiences and about a lack of respect for sacred garments. Is this a political message or just a move to seem “edgy” and receive publicity? I would venture to say it’s more of the latter, which is something to really be aware of when recreating wearable tech. As others have said, wearable technology won’t be wearable unless it’s fashionable; the overtly political and frankly, bizarre designs of the Stealth Wear render them both outlandish and impractical for popular consumption. The artist said “Stealth Wear is (about) combining fashion with privacy, exploring how fashion can provide ways to adapt to a surveillance environment.” It’s easy to imagine a situation in which these items could become widely available and shift the conversation from “should we use drones?” to a victim-blaming attitude in which those surveilled are responsible for protecting themselves against searches, rather than focusing on governments changing their invasive policies. Similar projects include the OFF Pocket (a phone sheath that prevents electromagnetic rays from transmitting data), CamoFlash (a clutch that uses LEDs to thwart attempts at flash photography of unwilling subjects) and Pixelhead (pixelated mask meant to confuse face-recognizing software). These projects clearly are meant to spark conversations about the intersections of privacy, surveillance and fashion in public space, and I’m interested to see what’s next.